Nvidia is actually the leader for both training and inference solutions. Things however are changing. 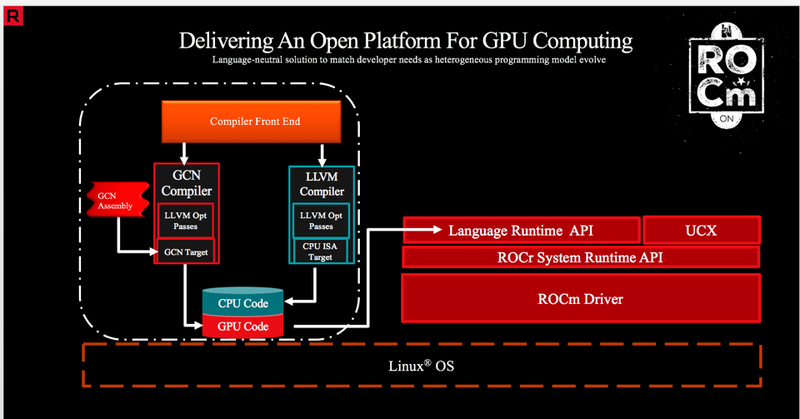 AMD is developing a new platform, called ROCm. It’s ambition is to create a common, open-source environment, capable to interface both with Nvidia (using CUDA) and AMD GPUs (further information). This tutorial, will explain how to set-up a neural network environment for training, using AMD GPUs in single or multiple configuration. On the software side: we will be able to run Tensorflow v1.12.0 as backend to Keras on top of the ROCm kernel, using Docker. To install and deploy ROCm are required particular hardware/software configurations. The official documentation (ROCm v2.1) suggests the following hardware solutions. Intel Core i7 v4 (i7–4xxx), Core i5 v4 (i5–4xxx), Core i3 v4 (i5–4xxx) or newer CPUs (i.e. Haswell family or newer). 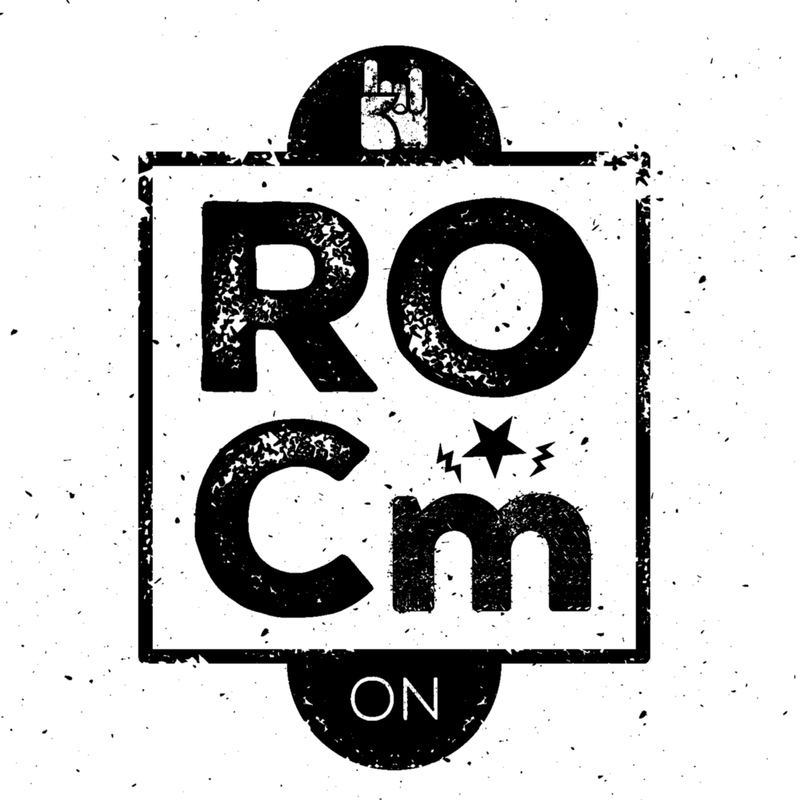 On the software side, the current version of ROCm (v2.1), is supported only in Linux-based systems. In order to get everything working properly, is recommended to start the installation process, within a fresh installed operating system. The following steps are referring to Ubuntu 18.04 LTS operating system, for other OS please refer to the official documentation. The official documentation suggests to create a new video group in order to have access to GPU resources, using current user. Is now suggested to test the ROCm installation issuing the following commands. The fastest and more reliable method to get ROCm + Tensorflow backend to work, is to use the docker image provided by AMD developers. Tip: To avoid inserting sudo docker <command> instead of docker <command> it’s useful to provide access to non-root users: Manage Docker as a non-root user. It’s now time to pull the Tensorflow docker provided by AMD developers. after few minutes the image will be installed in your system, ready to go. Because of the ephemeral nature of docker containers, once a docker session is closed all the modifications and files stored, will be deleted with the container. This command will create a folder named tf_docker_share useful for storing and reviewing data created within the docker. it means that you are now operating inside Tensorflow-ROCm virtual system. Jupyter is a very useful tool, for the development, debug and test of neural networks. Unfortunately it’s not currently installed, as default, on the Tensorflow-ROCm, Docker image, published by ROCm team. It’s therefore required to manually install Jupyter. It will install Jupyter package into the virtual system. Leave open this terminal. 2. Open a new terminal CTRL + ALT + T .
First column, represents the Container ID of the executed container. Copy that because it’s necessary for the next step. where tag value is an arbitrary name for example personal . It’s important to note that we will refer to this newly generated image for the rest of the tutorial. where, once again, tag value is arbitrary, for example personal . We can finally enter Jupyter environment. Inside it we will create the first neural network using Tensorflow v1.12 as backend and Keras as frontend. Firstly close all the previously executing Docker containers. 3. Close all the already open terminals. You should be logged into Tensorflow-ROCm docker container prompt. If the new tab does not appears automatically, on the browser, go back to the terminal where jupyter notebook command has been executed. On the bottom there is a link to follow (press: CTRL + left mouse button on it) then, a new tab in your browser redirects you to Jupyter root directory. In the last section, of this tutorial we will train a simple neural network on the MNIST dataset. We will firstly build a fully connected neural network. Let’s create a new notebook, by selecting Python3 from the upper-right menu in Jupyter root directory. A new jupyter notebook should pop-up in a new browser tab. Rename it tofc_network by clicking Untitled on the upper left corner of the window. We are using Tensorflow v1.12.0. 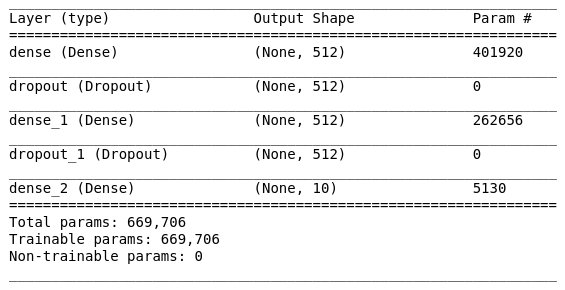 Let’s set batch size, epochs and number of classes. We will now download and preprocess inputs, loading them into system memory. We will use a very simple, two-layer fully-connected network, with 512 neurons per layer. It’s also included a 20% drop probability on the neuron connections, in order to prevent overfitting. Despite of the simplicity of the problem, we have a considerable number of parameters to train (almost ~700.000), it means also a considerable computational power consumption. Convolutional Neural Networks will solve the issue reducing computational complexity. The neural network has been trained on a single RX 480 with a respectable 47us/step. For comparison, an Nvidia Tesla K80 is reaching 43us/step but is 10x more expensive. As an additional step, if your system has multiple GPUs, is possible to leverage Keras capabilities, in order to reduce training time, splitting the batch among different GPUs. It’s also necessary to add multi_gpu_model function. As an example, if you have 3 GPUs, previous code will modify accordingly. That concludes this tutorial. 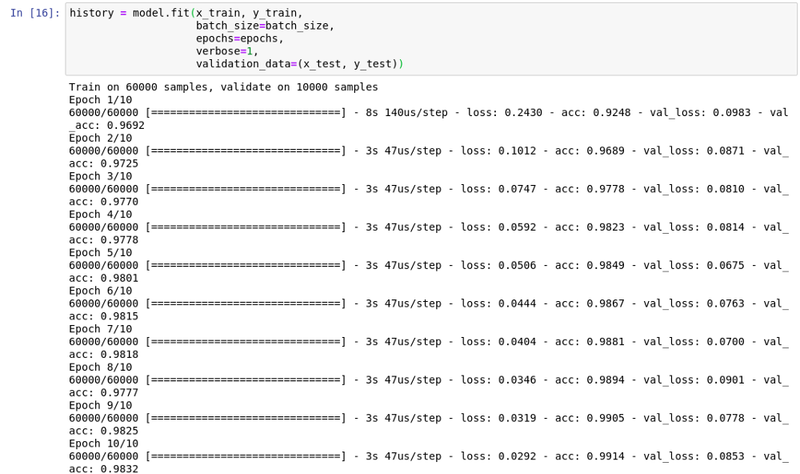 Next step will be to test a Convolutional Neural Network on MNIST dataset. Comparing performances in both single and multi-GPU. What’s relevant here, is that AMD GPUs performs quitely well under computational load at a fraction of the price. GPU market is changing rapidly and ROCm gave to: researchers, engineers and startups, very powerful, open-source tools to adopt, lowering upfront costs in hardware equipment. Please feel free to comment this article in order to improve his quality and effectiveness.